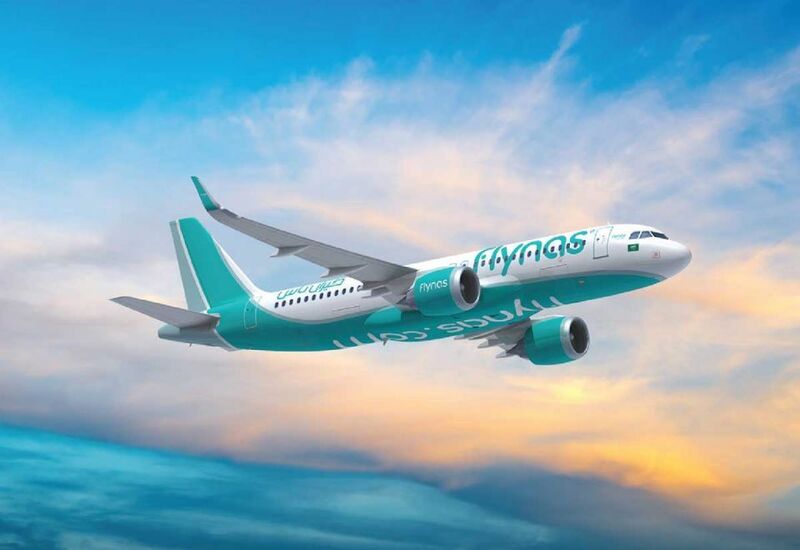 The Flynas website is simple to use and follows the basic format of most low-cost-carriers (LCCs). The most prominent item is the booking function, and this is simple to use and presents fares in 3 categories Light (7kg hand baggage only), Plus (7kg hand baggage and 20kg hold bag) and Premium (7kg hand baggage, 30kg hold bag and a snack). Flynas also offers a Business Class product which is displayed in the search results. For more advanced purchases, customers may choose to hold a fare for 48-hours which I do on this occasion, but unfortunately, the system has a glitch, and my reservation is discarded a couple of hours earlier than I was expecting. Luckily, I can book at the same price, and the system offers a decent upsell of an inclusive 30kg checked bag, priority seat reservation and sandwich and bottled water meal for a fee of 99 Riyals (around £20 GBP) which seems good value. While I did not intend on using the checked bag, I was concerned my hand carry may exceed the allowance, and this was a decent contingency. Dammam King Fahd International Airport is a 40 to 60-minute drive from the city. While there is a public bus service available, most customers arrive by car, taxi or ride-share such as Uber. I use Uber today from my hotel, and the fare is around 85 Riyals (approximately £17 GBP). 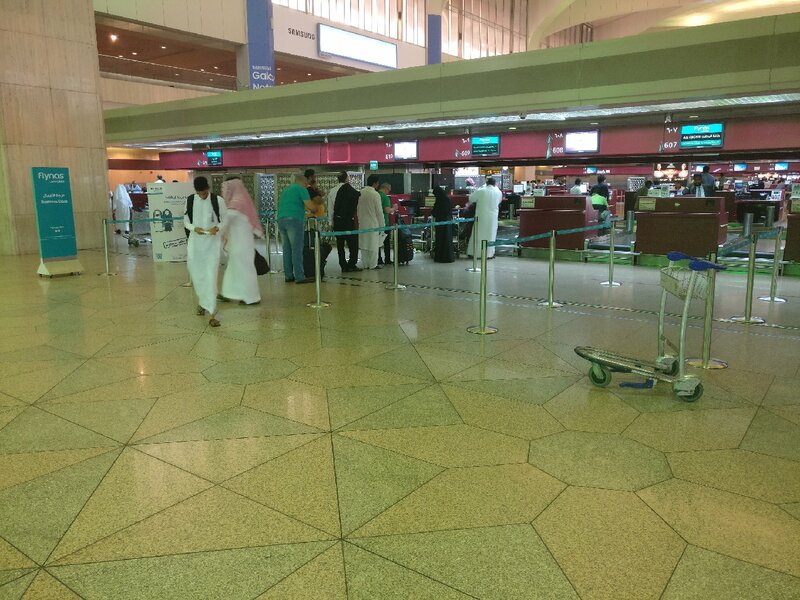 Flynas check-in is conveniently positioned in Line 1 which is the nearest the to the terminal entrance. There is initially some confusion as the overhead monitors suggest that customers may check-in at any of the counters, but it turns out the operation is split between International and domestic flights, and this is unclear. In any case, the wait time is short, and I am processed by a friendly member of staff efficiently. I did not need to worry about my hand carry which is checked visually but not weighed, and I do not see any other checks before boarding the aircraft. Unusually for an LCC, there are no weight/size measures around check-in, and this aspect of the experience is all quite relaxed in comparison to the more cutthroat European, US and Asian low-costs. I receive my pre-selected window seat, and the staff direct me to the domestic departure area, which is a level down from check-in here in Dammam. Security processing is quick if not particularly friendly, and I am soon in the gate area. 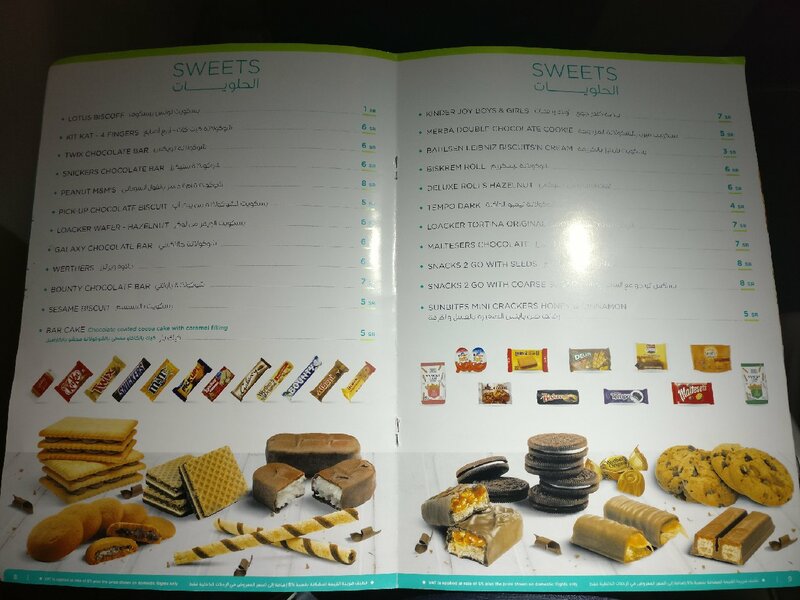 For a regional airport, Dammam has a broad representation of International dining choices, and while this is mainly fast-food and coffee shop brands (think McDonald’s, Subway, Starbuck’s and suchlike), it means that there is something for most customers to enjoy. Boarding is scheduled to begin 45-minutes before the stated departure time and is called around 10-minutes after this. While my boarding pass has Zone 2 printed on it, as this is a bus gate all passengers embark at the same time. Unfortunately, the first bus is full before I can get on, and there is a 10-minute wait until the next vehicle is ready to depart. At the aircraft I am greeted by friendly cabin crew that guide me to 5A, which is my paid-for priority seat directly behind Business Class – the leg space is excellent. Airbus A320 in Economy Class is at approximately 30% capacity this evening. All fares include a 7kg hand carry bag in Economy Class. Plus tickets have an inclusive 20kg hold bag, and Premium 30kg checked bag. The fee for additional bags varies between domestic and International routes but for domestic flights customers may pre-purchase 15kg for 55 Riyals (£11 GBP), 20kg for 90 Riyals (£18 GBP) or 25kg for 125 Riyals (£25 GBP). At the airport, a 20kg is 150 Riyals (£30GBP) which is close to double the pre-paid rate. My seat (5A) is directly behind Business Class and provides excellent legroom for this 1h40m flight. Upholstery is stylish blue leather, and the condition is excellent. Given this is a low-cost airline there are no add-ons for seat power/USB and PTV, and it remains to be seen if Flynas will add these products in future. 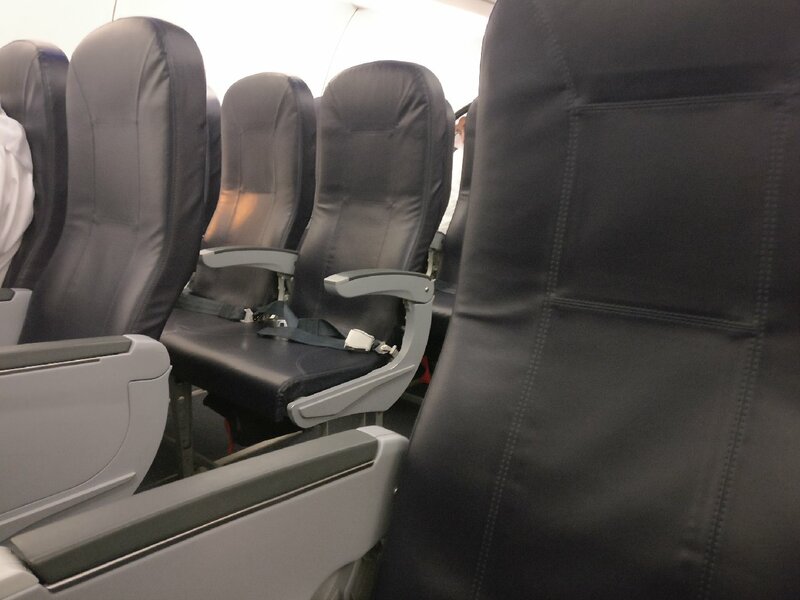 The A320 used this evening is around 10-years-old but looks brand new, and the carpeting, seats and other fixtures and fittings are immaculate. 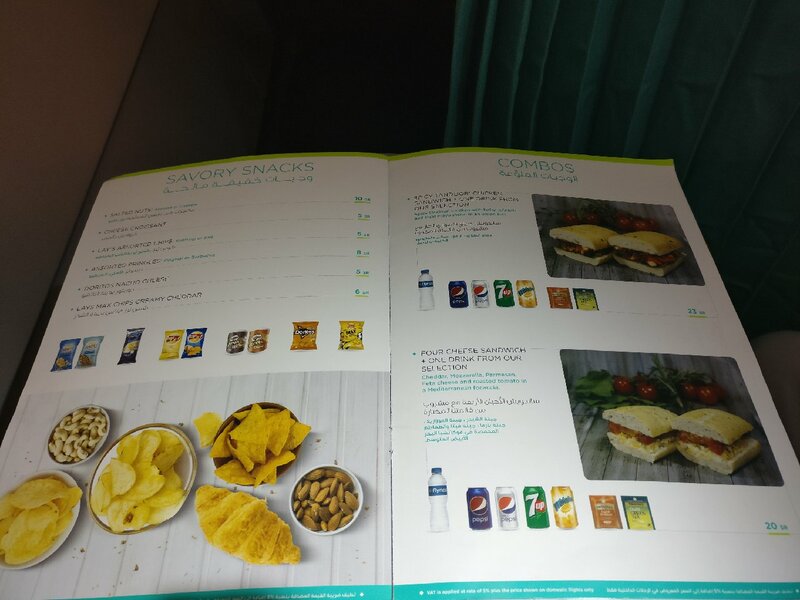 The interior colouring is all quite neutral with navy leather seat covers, and the main facet of Flynas branding comes through the turquoise cabin divider curtain – it is all most pleasant. There are the usual 2 rear cabin washrooms for Economy Class passengers, with the forward facility dedicated to Business Class. The flight leaves the remote stand in Dammam on-time and departs 7-minutes later, and we arrive into Madinah 30-minutes early at 08.40pm. The buy-on-board service begins promptly after departure, and my pre-ordered sandwich and water are delivered in a neat brown paper bag. The quality is really quite fine and as good as one can expect for cream cheese and cucumber. The bread is soft and fresh, and the filling is generous. 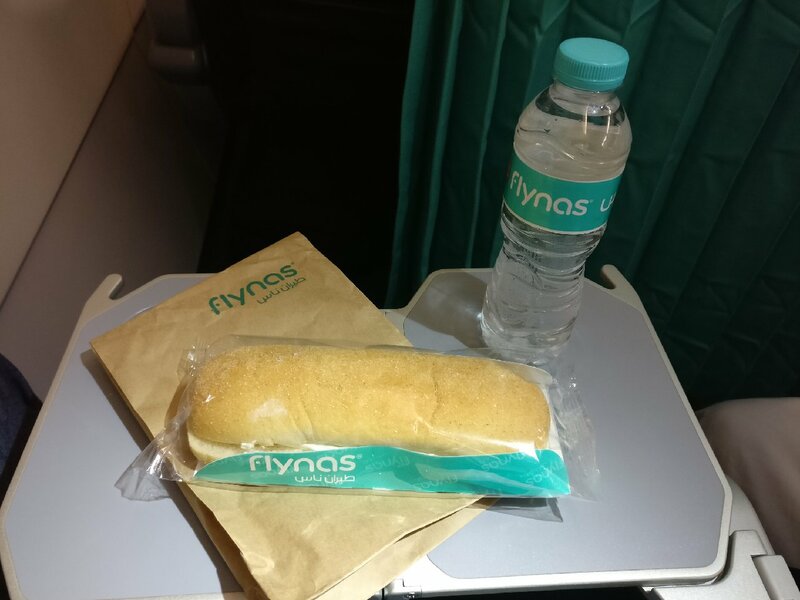 The water is branded in a Flynas label and is served chilled. For purchase, there is a range of the usual sandwiches, snacks and drinks. 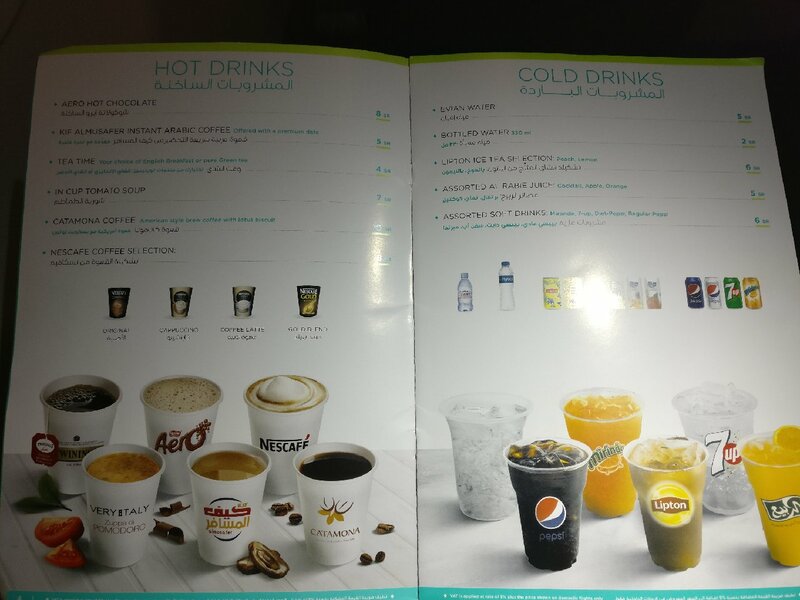 Being a Saudi airline, there is, of course, no alcohol, but the beverage product covers the main western brands of soft drinks (in full-size 330ml cans), juices, ice tea and water. For hot drinks, there is Twining’s tea, 4 choices of Nescafe coffee and American and Arabic coffee. There is also hot chocolate and a tomato cup soup. The snack choices are mainly recognised global products and the options are quite extensive in the different sections. There are also 3 fresh sandwiches choices, and customers on flights above 2.5-hours may choose from 2 hot dishes. 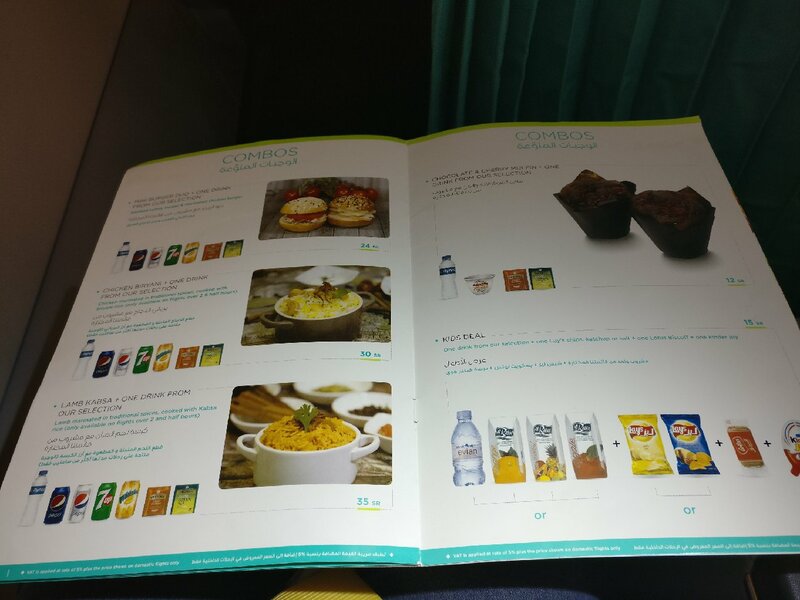 On certain flights, it is also possible for customers to pre-order from a range of other hot entrees, but this is not tested for this recent flight. This A320 is fitted with the Flynas streaming naStream which can be accessed through the web browser of any WiFi-enabled device (no download necessary). The system is easy to use and works well on my Samsung tablet. The movie choices total 11 which is a mix of local Arabic language, Bollywood and 2 English titles. There are 36 TV shows which cover a varied range of domestic and International choices. The music album selection is excellent with more than 300 titles across numerous world genres. Overall, the content is as one might expect geared towards the regional network with mainly shorter programming, but this is quite a promising system. There is an inflight magazine, and I think it is fair to say that the scope of content is mainly local but given the route structure this is expected. The print quality is good, and the publication has a nice premium feel. There are some interesting airline news features, as well as various route network and aircraft information. Advertising density is fair, and there is a good number of articles – it is all quite balanced. As this flight is a low-cost domestic flight of less than 2-hours, there are no comforts to speak of, but customers may purchase a sleep kit from the inflight sales catalogue for 35 Riyals (£7 GBP). The impression of the staff begins favourably with a good welcome at the aircraft door, and this is reinforced by other crew in the cabin. The flight is not busy, but there is a willingness to assist customers with baggage, and this is appropriate given the number of older passengers onboard tonight. The safety display and checks are professionally completed, and we are quickly taxiing for departure. The flight deck are not particularly chatty at any point during the flight, and this stands as the primary weakness. Once airborne, I am served with my pre-ordered snack as one of the first service items. If I am to be picky, I was not offered the opportunity to purchase anything else from the cart, and before really having chance to ask, the staff swiftly move on through the first rows. Given the light passenger load the crew are back within 15-minutes to clear up the litter, and there is an announcement regarding the inflight shopping sales, and another cart goes towards the rear of the aircraft, but there is evidently not much interest in the items. There is a medical emergency during the flight, and this is dealt with very well. Aside from the usual request for assistance (which does arrive), a member of staff sits patiently with the customer providing oxygen, and they do come and check back on their welfare at various points before arrival. Business Class customers are given priority deplaning, and staff efficiently shepherd on medical staff while ensuring there is space for other customers to leave the aircraft. However, this turns out to be in vain as we meet a locked door once in the terminal and it is over 5-minutes waiting before a member of staff comes to open this. I am unsure if this is an airline or airport issues, but it is irritating nonetheless. The baggage belt has started by the time we reach the reclaim area, and the first items start appearing a few minutes later. Medina Airport is compact, and it is a short 50-metre walk to the kerbside for transport. The airport is connected to the city by regular public bus (10 Riyals), taxis and ride-share services such as Uber and Careem. I opt for another Uber, but this airport does not seem as well populated as other airports with available cars, so I do have a short wait. In normal traffic, it is 20 to 25-minutes to my hotel which is on the edge of the Haram. This was a really decent experience in consideration of the price paid (£78-one-way with luggage, seat and snack). 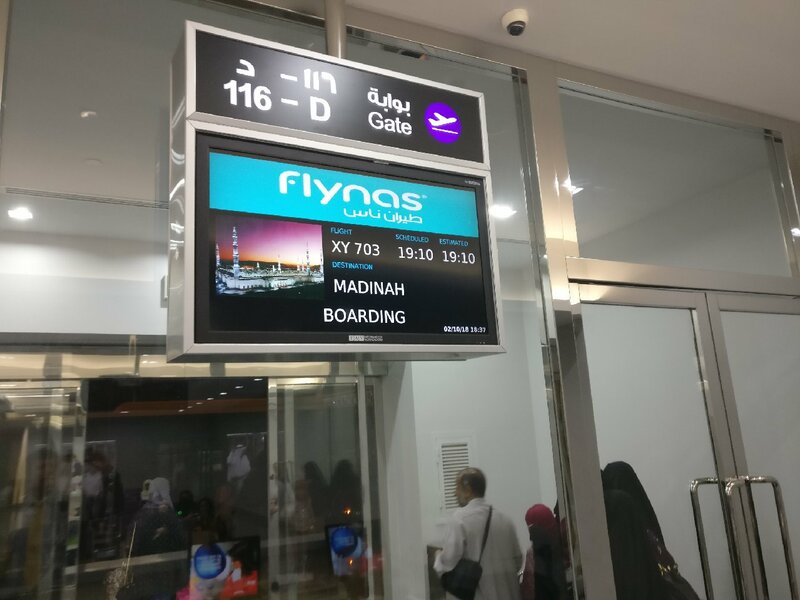 In a practical sense, the airport experience is no different from a better full-service airline, and it appears that Flynas is yet to employ any of the more surreptitious charging practices that many have come to expect in the low-cost market. However, perhaps staff would be more punitive for baggage weight and size for busier flights. The aircraft seemed new and clean, and my extra legroom seat provided good comfort. The IFE was a pleasant surprise as I was not expecting this (which suggests that Flynas could do more to market the service), and the system simple to use. There is no seat power product which may end up being short-sighted as customers are expected to use their personal devices for the IFE – certainly on the longer flights to India and Africa this may end up being an issue. I did not sample anything from the main buy-on-board menu – however, my pre-ordered sandwich was enjoyable and good value. There is not much that one can expect from the staff on this type of short, domestic flight, but most of the service was done with good pace and efficiency and the crew did display a caring side as and when needed.